Tanaka Atsushi giving a presentation. 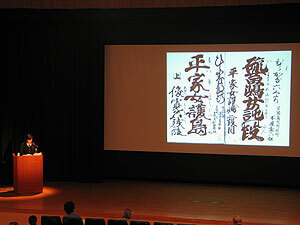 On December 4 and 5, a research forum commemorating the 20th anniversary of the founding of the Art Documentation Society was held at the Heiseikan Auditorium of Tokyo National Museum (for the lecture) and the Heiseikan small hall (for presentations such as exhibits). The forum was subtitled as “The Current Status, Issues, and Future of the coalition of M(useums), L(ibraries) and A(rchives)”, and the presentations and exhibits were given by nine relevant organizations concerned with cultural properties as well as art. 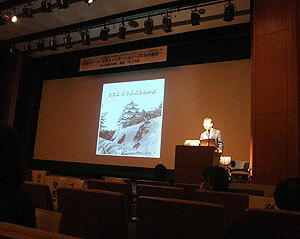 Our Institute’s Department of Research Programming participated in the forum, and I gave a presentation under the title “Focusing on the Digital Archives of the Yearbook of Japanese Art”: I referred to the significance of the Yearbook of Japanese Art, which was first issued in 1936 and continues to be issued today, and mentioned various issues concerned with the editing of the yearbook in the information age. Then I presented suggestions for the utilization of information accumulated to date and further active publication. For the exhibition, I introduced our Institute’s database of the interior photos of Nagoya Castle prior to its destruction by fire. 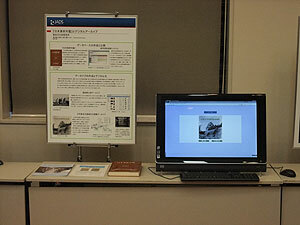 As one of the accomplishments of the joint research with the National Institute of Informatics, I also introduced the database (prototype edition) on the association retrieval site So (Imagine), which contains valuable photos of various Asian areas taken by our former researcher Odaka Sennosuke in 1932. The presentations and exhibitions allowed me to introduce the current status of Department of Research Programming in terms of information transmission, and also gave a glimpse into the future. In December 2009, we created a new English version of the National Research Institute for Cultural Properties, Tokyo’s Kids Pages. The English version is composed of the “All our tasks”, “Active in the world”, “Why and what? Tobunken”, and “Link to cultural properties” pages in the same way as in the Japanese version. Recently, the Institute has increasingly conducted activities linking to people overseas, including international cooperation for conserving and restoring overseas cultural properties originating in Japan and promotion of research collaboration with overseas researchers. These trends can also be seen in the Japanese Kids’ Pages “Tobunken shigoto zenbu (All our tasks)” and “Sekai de no katsuyaku” (Active in the world). We created the English Kids’ Pages with the hope that children around the world will learn about activities of the Institute in the same way as Japanese children. The English Kids’ Pages are very unique among the websites in a country where English is not used as a native language, and are also the first cultural properties website for children. From December 2009 we started accepting registrations to our mail magazine. The mail magazine will offer information about what’s new with at the website. 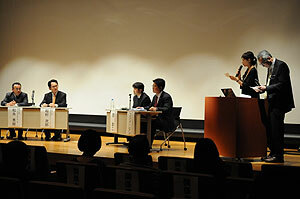 The Department of Intangible Cultural Heritage held a fourth public lecture on Wednesday, December 16 at the Hall of the Edo-Tokyo Museum. These past several years the public lecture sessions have used a theme of listening to audio recordings which have been recorded by the Cultural Properties Protection Commission (currently the Agency for Cultural Affairs) as part of its activities on the protection of cultural properties. This year we took up the second dan “Kikaigashima” of “Heike Nyogonoshima”, recorded in March 1949, under the title “Oral tradition of Gidayubushi”. Performers Toyotake Yamashironoshojo (1878-1967) and Tsurusawa Seiroku IV (1889-1960) were certified as the holders of important intangible cultural properties for Ningyo Jorur (Japanese puppet show) Bunraku Dayu (singer) and Ningyo Joruri Bunraku Shamisen, when the system started in 1955; in other words, they were living national treasures. The many recordings they left are approved as superbly normative performances even today. “Kikaigashima-no-dan (Shunkan)” is one of those recordings as well. In the first half of the lecture session, we considered the meaning of the recordings and the relationship they currently have with oral tradition, and in the second half we enjoyed the consummate art of both performers, listening to half of the entire recording. 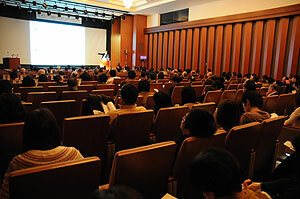 On December 8, 2009, we held a seminar on the theme of “energy conservation at museums with a view to maintaining an appropriate environment for cultural properties” in the seminar room of the National Institute for Cultural Properties, Tokyo, for the second straight year. 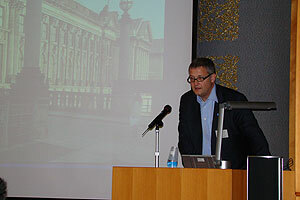 This year, Dr. Stephan Simon from the Rathgen Conservation Laboratory in Germany gave a lecture under the title of “Conserving energy at museums and the conservation environment in exhibition/storage facilities in Europe”, and Professor Hokoi Shuichi from Kyoto University gave a lecture titled “Conserving energy for museums in a warmer environment”. Moreover, Dr. Ashie Yasunobu from the Ministry of Land, Infrastructure and Transport presented a lecture under the title of “Approaches for achieving sustainable urban spaces in a low-carbon society”. Finally, Dr. Kanba Nobuyuki from the Tokyo National Museum presented a lecture under the title of “Conserving cultural properties coexisting with a low-carbon society” and introduced the activities in place at the Museum. A total of 75 people participated in the seminar and held active discussions. The Center for Conservation Science and Restoration Techniques has been removing the mural paintings of Kitora Tumulus as part of a project “Investigation on Conservation for special historic site Kitora Tumulus” entrusted by the Agency for Cultural Affairs. Following the first work of removing in May, we continued the work in two periods of three weeks each, from October 19 to November 6, and from November 16 to December 4. Although the work in autumn took longer than that in May, performing the removal over periods of three weeks each enabled efficient removal progress. All plaster on the ceiling was detached by this latest work, and we will be able to resume removal of the plaster on the side walls for the first time in two years. We will continue to inspect the in side of the tumuls periodically, while irradiating UV-C to control microorganisms, and conduct removal again next year. Ms. Amira Edan al-Dahab giving a lecture. 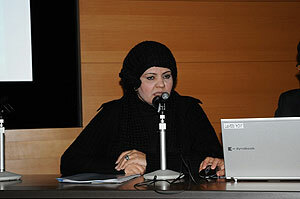 On December 2, we hosted a lecture by Ms. Amira Edan al-Dahab, the chief of the secretariat of Iraq National Museum, at the meeting room on the basement floor of the National Research Institute for Cultural Properties, Tokyo. 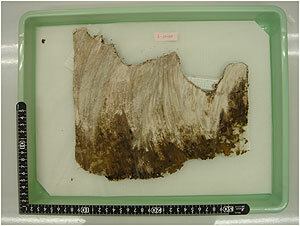 The news on the 2003 looting of the Iraq National Museum in chaos in after the Iraq War shocked the world. The Iraq National Museum resumed operation at last in February 2009, supported by the international community, including Japan, Italy, and many other countries. Ms. Amira came to Japan this time under the auspices of the Foreign Ministry’s “Invitation for Promoting Partnership in the 21th Century”, and took this opportunity to hold a lecture. She reported on the long path from the looting of the Museum to its re-opening and the numerous troubles that accompanied each step with showing many photos. Ms. Amira also referred to the training of Iraqi conservators that is held by the Japan Center for International Cooperation in Conservation, funded by grants from the UNESCO/Japanese Funds-in-Trust and the Institute, and the government subsidized budget ,and repeatedly asserted that the continuous support from Japan is indispensable to restore the cultural properties in Iraq. 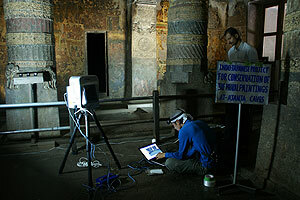 The National Research Institute for Cultural Properties, Tokyo and the Archaeological Survey of India (ASI) are conducting joint research on the conservation of the mural paintings of the Ajanta Caves under the framework of “the Exchange Program of International Cooperation of Cultural Heritage” commissioned by the Agency for Cultural Affairs and the government subsidized budget for “the Cooperative Project for the Conservation of Cultural Heritage in West Asia”. 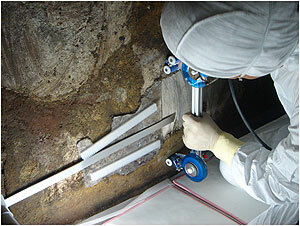 In the third mission, undertaken from November to December 2009, we tried to solve various issues, including bat excrement, discoloration due to the yellowing of the previously-used varnish, and cracks and floating in the colored layers, and performed tentative cleaning of the mural paintings with ASI specialists. We established a joint research contract with Doshisha University on digital documentation for mural painting conservation and jointly performed three-dimensional measurement to create drawings of the current status of the Cave No. 2 and No. 9. 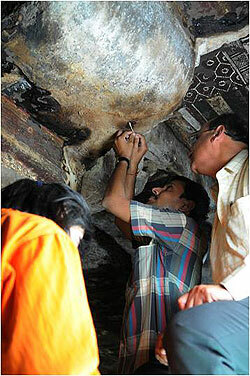 We executed these conservation and measurement procedures together with Indian specialists and shared knowledge on conservation of cultural heritage and performed technical exchange aiming at capacity development and transfer of techniques. This program was planned as a five-year project starting in 2006, and is currently in its fourth year. We executed a training course on the conservation of historical buildings from this spring to summer, followed by a museum technical training course for three months from September 14 to December 11, as the second program for 2009. A total of 14 trainees from Shinjang, Gansu, Ningxia, Shanxi, and Henan provinces and autonomous regions gathered along the Silk Road in China, took theoretical course lessons in Beijing for two months, and then took practical course sessions at the Ningxia Museum in Yinchuan city of Ningxiahuizu Autonomous Region for one month from the middle of November. During this period, a total of 15 instructors participated in these courses from the Institute, the Tokyo and Kyushu National Museums, universities, and studios producing materials for protection of cultural heritage, and conducted classes with the Chinese instructors. The training at Ningxia Museum was on the measurement and analysis of the storage/exhibit environment, and the creation of theme exhibition design plans based on an actual museum’s stored items and exhibition rooms. The trainees had learned enormous amount of ideas and technical theories through the classes, conducted over many hours by the Japanese and Chinese instructors and were able to gain an secure understanding of the ideas and techniques through on-the-job training. 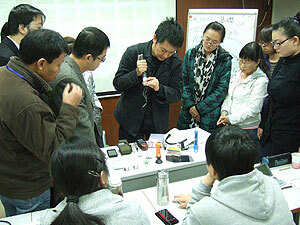 This systematic museology training course provided with both theory and practice was first realized in China. The Ningxia Museum, which was completed in 2007 and is equipped with the state-of-the-art hardware, presented a challenge in that it was not in satisfactory condition on how to do the daily operation. We were glad that the acceptance of these training sessions inspired the museum’s staff. 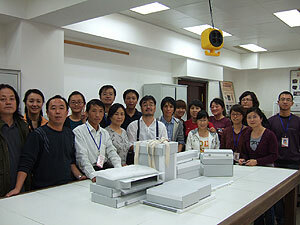 The completion ceremony on December 11 was attended by more than 50 of the museum’s staff members. The Program for Capacity Building along the Silk Road will be finished when the training course for conserving and restoring textiles and mural paintings is conducted in next year.